LANGLEY — The top two teams at each of B.C.’s four tiers held court for the week as the drive towards the post-season continues. Last week —Won all three games to finish first as host at B.C. Catholic Championships. Def. St. John Brebeuf 55-30, def. St. Thomas Aquinas 62-54, def. Vancouver College 64-59. Def. Enver Creek 72-57. This week — Jan. 24 at Fleetwood Park. Jan. 28 vs. North Surrey. Jan. 29 vs. Queen Elizabeth. Last week — Def. Claremont 96-92 (OT). This week — Open play Thursday vs. Charles Hays at Vancouver College Emerald tournament. Jan. 29 vs. Claremont. Last week — Def. Riverside 109-55. Def. Dr. Charles Best 99-49. This week — Jan. 24 vs. Pinetree. Jan. 28 vs. Port Moody. Jan. 29 vs. Centennial. Last week — Won two of three games to finish second at B.C. Catholic Championships. Def. Notre Dame 88-28, def. St. Patrick’s 55-44, lost 64-59 to Holy Cross. Def. St. George’s 90-89. This week — Open play Thursday as host of own Emerald Tournament vs. Belmont. Jan. 29 vs. St. Patrick’s. Last week —Def. Richmond 101-71. Lost 90-89 to Vancouver College. This week — Jan. 24 at Byrne Creek. Jan. 29 vs. Burnaby South. Last week —Won two of three games to finish second at Abbotsford Snowball Classic. Def. Belmont 78-68, def. W.J. Mouat 81-73, lost 95-77 to Mt. Vernon (NY). Def. Cariboo Hill 77-58. This week —Jan. 23 at Burnaby North, Jan. 28 vs. Byrne Creek, Jan. 29 at St. George’s. Last week — Won final three games to place first at Surrey RCMP Classic. Def. Clayton Heights 79-78, def. Tamanawis 75-71 (OT), def. Lord Tweedsmuir 89-82. Def. Panorama Ridge 91-49. This week — Open play Thursday vs. SMUS at Vancouver College Emerald tournament. Jan. 29 vs. Tamanawis. Last week — Won three of four games to finish third at RCMP Classic. Def. Princess Margaret 115-28, def. Southridge 101-49, def. Fleetwood Park 79-74, lost 89-82 to Semiahmoo. Def. W.J. Mouat 77-67. This week — Open play Thursday vs. Kitsilano at Vancouver College Emerald tournament. Last week —Won three of four games to finish third at Surrey RCMP Classic. Def. Queen Elizabeth 84-42, def. Pacific Academy 101-68, lost 75-71 (OT) to Semiahmoo, def. Fleetwood Park 61-48. Def. Sullivan Heights 90-40. Def. Princess Margaret 94-42. This week —Jan. 25 vs. Centennial at Sir Charles Tupper Eastside Story. Jan. 29 at Semiahmoo. Last week — Won three of four games at Abbotsford Snowball Invitational. Def. Sir Charles Tupper 80-69, def. Walnut Grove 76-72, lost 81-73 to Burnaby South, def. Abbotsford 83-73 (OT). Lost 77-67 to Lord Tweedsmuir. This week — Jan. 25 at Lord Tweedsmuir, Jan. 29 vs. Abbotsford. Last week —Won two of three games at Abbotsford Snowball Classic. Lost 97-70 to Abbotsford, def. Centennial 96-80, def. Belmont 99-84. Def. Mt. Boucherie 96-68. This week — Jan. 29 vs. Penticton. Last week — Won two of three games at Abbotsford Snowball Invitational. Def. 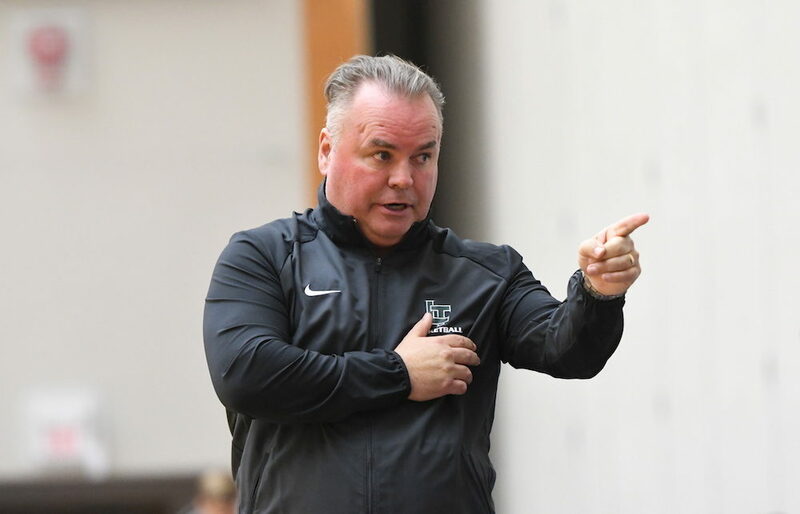 Robert Bateman 84-54, lost 78-68 to Burnaby South, def. Walnut Grove 82-71. Def. Claremont 65-53. This week — Open plat Thursday vs. host team at Vancouver College Emerald. Last week —Lost two of three games at Abbotsford Snowball Invitational. Lost 76-72 to W.J. Mouat, lost 82-71 to Belmont, def. Centennial 80-64. Def. Abbotsford 88-75. This week — Do not play. Last week — Split four games as host of own Snowball Invitational. Def. MEI 118-47, def. Kelowna 97-90, lost 110-75 to Mt. Vernon (NY), Lost 83-73 (OT) to W.J. Mouat. Lost 88-75 Walnut Grove. This week —Jan 24 vs. W.J. Mouat, Jan. 29 at W.J. Mouat. Last week — Def. West Vancouver 63-51. Def. Carson Graham 64-57. This week — Open play Thursday vs. Heritage Woods at Vancouver College Emerald tournament. Jan. 29 vs. Sentinel. HONOURABLE MENTION — Bulkley Valley Christian Royals (Smithers) (NR), Nanaimo Christian Trail Blazers (HM), St. John’s Eagles (Vancouver) (HM), Vernon Christian Royals.